Looking for a way to draw extra attention to the fliers and announcements on your bulletin boards? Enclosed cork boards from United Visual come with headers that are sure to be noticed by everyone who passes by. With your school or company name displayed prominently, people will know who is sponsoring the exciting events and providing useful information. 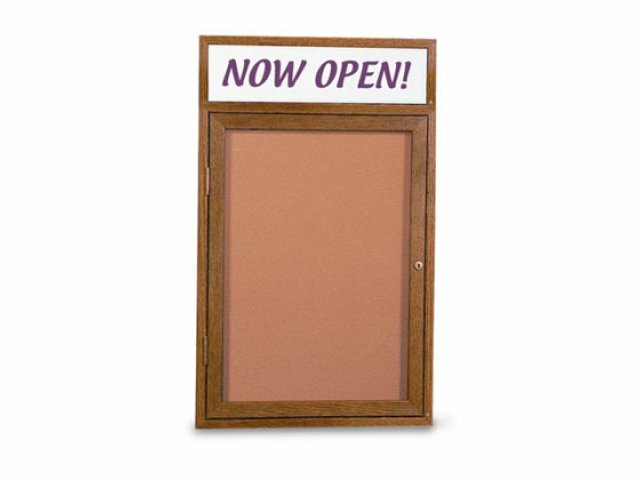 These enclosed bulletin boards are made from self-sealing natural cork protected by a solid oak frame with a rich walnut stain. Locking shatterproof acrylic doors prevent tampering and ensure that all of your papers stay in place. 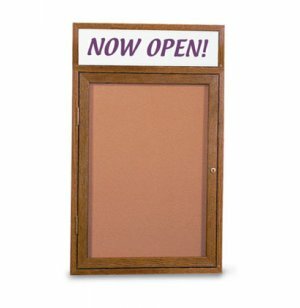 When you pin, staple or tack up new papers on these sturdy bulletin boards, you ensure that people will take note of information you are providing. Personalized Message: The name of your company, school or organization is prominently displayed in Black Helvetica lettering on the header. Make sure to specify your header text in the "Special Instructions" box when checking out. Customized Option: Custom header logos are available for an additional charge (camera-ready artwork or EPS computer file required).